181 Fremont is one of several new buildings that will change the skyline in San Francisco's South of Market/Transbay neighborhood by offering more housing and office space. Currently under construction, this project demonstrates modernism in design, sustainability, and neighborhood integration. Standing at approximately 800 feet and 54 stories tall, 181 Fremont will accommodate 420,300 square feet of office space and 74 residential units on the top 15 floors. 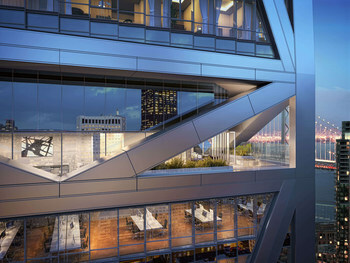 The unique structural system will be expressed on the building's exterior, enhancing the skyline expression, and adding a dramatic focal point to this newly evolving district of the city. Located between the historic Marine Electric Company building and the future home of the new Transbay Terminal, this mixed-use high-rise at 181 Fremont will offer breathtaking views of the San Francisco Bay and its urban waterfront environment. In the pursuit of a LEED Platinum certification, several innovative design features, including a curtain wall design, a green roof, and recycled materials make this a truly distinctive project.